In 2007, director-writer Abi Varghese spent his weekends tossing around ideas with friends for a possible sitcom that would chronicle some of their shared experiences of growing up Indian in America. “We were doing this out of our parents’ living room and we were really just starting out and trying to figure out how to tell a story [with] not much of a budget,” Varghese told NBC News. Those conversations eventually became the inspiration for “Akkara Kazhchakal,” a Malayalam-language sitcom that landed a 30-minute slot on an Indian television station for several seasons. “That really took off after we put it on air and YouTube and it kick-started our career because it went viral and everyone was talking about it,” Varghese said. After receiving positive feedback for the series (and millions of hits on YouTube), Varghese and his colleagues shifted their attention into launching a new comedy series that would appeal to a broader audience. “Brown Nation,” which was released on Netflix on Nov. 15, 2016, zeroes in on the story of Hasmukh (played by Rajeev Varma) — the owner of an IT consulting firm, Shree Ganesh Computers Limited Inc.
Hasmukh attempts to balance work-life troubles in Queens, New York, while keeping the romance alive with his artist-actress wife, Dimple (played by Shenaz Treasuryvala ), and living under the same roof with his father-in-law, Papaji (Kapil Bawa). For much of the series, Hasmukh is the root of Papaji’s stress (Papaji’s heart monitor almost always beeps the second Hasmukh enters the room). Some of the early scenes in the series focus on newly-wed issues and dealing with in-laws as well as the day-to-day challenges of running a small business (training new recruits and transforming the office during a video conference call to ensure that the company appears “American”). The 10-episode comedy-drama lightly touches upon arranged marriage, but tries not to focus too much on the subject, because it’s a topic that has been overdone, according to Varghese. During the writing process, the team didn’t set out to make anything revolutionary, or to make any big statements, Varghese said. The series was more of an opportunity to put 22 minutes of entertaining and relatable comedy out there for the world to watch. The team was also careful not to exaggerate or portray the characters in the series in an unrealistic manner. 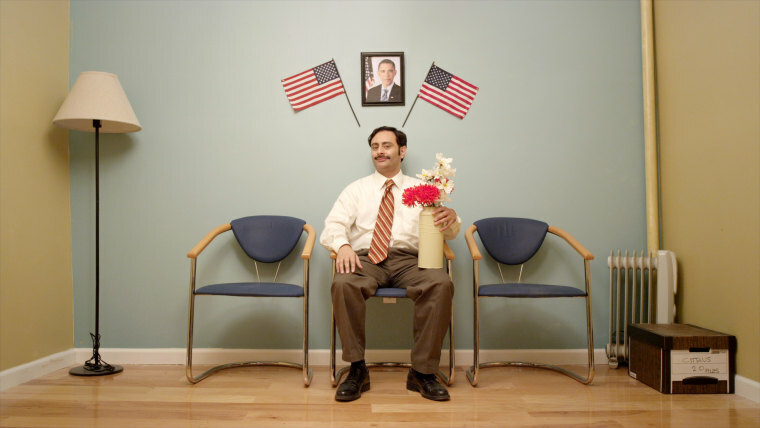 Varghese calls “Brown Nation” a mix between “Everybody Loves Raymond” and “The Office.” The series features a cast of Bollywood and Hollywood actors, including Omi Vaidya (from Bollywood film “3 Idiots”), Kapil Bawa, Melanie Chandra ("Code Black"), Jonathan Horvath, and others. “When we got into casting aspect we tried to get as many diverse and different type of actors to play it so that we mix up the comic timing,” Varghese said. At times, Varghese didn’t know how well the series would be received, or whether the jokes would fall flat. In the editing room, the “Brown Nation” team went back and forth on whether to omit or keep certain scenes that were targeted toward an Indian audience. While Netflix green-lit 10 episodes of the independent production, the series was a difficult pitch to other platforms, according to Varghese. He and his team initially started pitching “Brown Nation” to mainstream Indian platforms such as Star India and Zee TV, but hit dead ends once they realized the networks were looking for an Indian soap opera. It took approximately four to five months to write “Brown Nation,” followed by 30 days of shooting the series in 2014 in Queens, Brooklyn, and New Brunswick, Varghese said. Netflix picking up the series is a hopeful sign for independent filmmakers and another step into offering a variety of diverse content to audiences, according to Varghese. Varghese noted that series like “The Mindy Project” and “Master of None” have tremendously paved the way for South Asian representation, but while there is progress, there are more stories to tell. “Our show is a little bit quirkier, I don’t think it’s as drama driven as the other two shows, but I think there’s a lot more stories that we’re able to explore,” Varghese said. Varghese is hoping for a second season of “Brown Nation,” but for now, he’s focusing his efforts on another series called “Metropark.” He hopes to hold off on “Brown Nation” and take a closer look at the type of feedback the series elicits to see if there’s enough substance for another season. “I just want to make sure that people, when they hear ‘Brown Nation,’ to get a smile out of it….just trying to make 22 minutes that would put a smile on people’s faces after a rough day or something you can watch with your family that doesn’t have any sexual innuendos or fights. Just plain, simple, comedy,” Varghese said. Follow NBC Asian America on Facebook, Twitter, Instagram, and Tumblr.